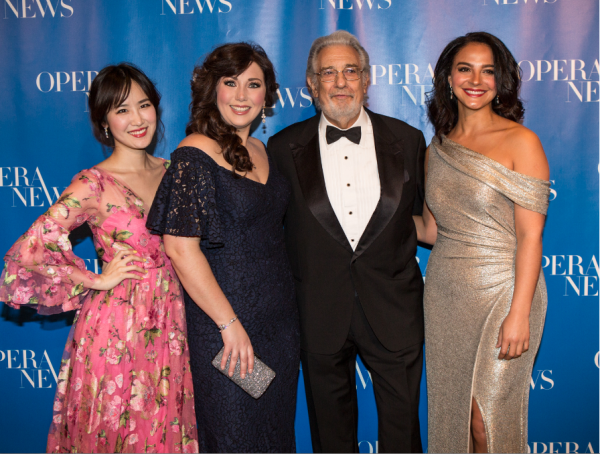 More than 400 opera aficionados and performers– including opera stars Alice Coote, Jennifer Rowley and Laurent Naouri – were among those who attended the 13th Annual OPERA NEWS Awards at The Plaza Hotel last night – one of the most prestigious opera events of the year! 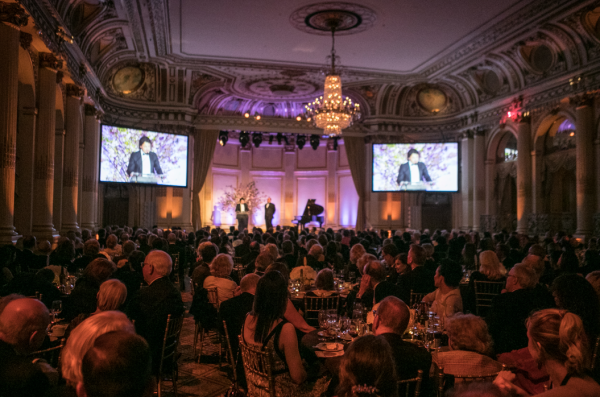 This year’s honorees — conductor William Christie, mezzo-soprano Fiorenza Cossotto, tenor Vittorio Grigolo, soprano Hei-Kyung Hong, and soprano Sonya Yoncheva — were feted at the gala affair with a captivating performance by award winning mezzo-soprano Stephanie Blythe. Each honoree gave moving speeches about their beginnings, rise to fame, and highlights from their career. 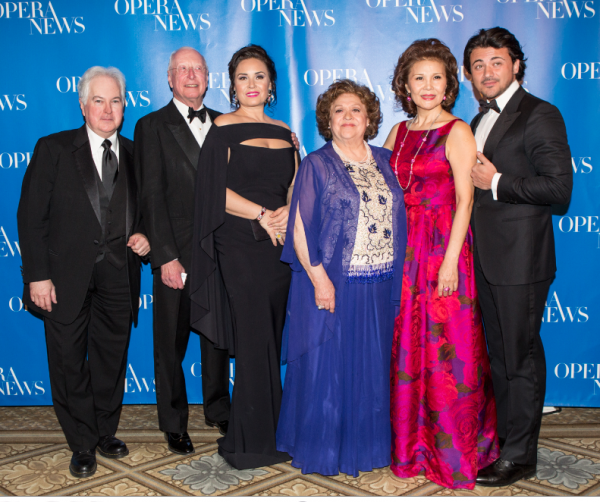 Placido Domingo, Quinn Kelsey, Joyce DiDonato, James Morris, and Dolora Zajick joined Metropolitan Opera Guild President Richard J. Miller and OPERA NEWS Editor-in-Chief F. Paul Driscoll in presenting the awards for distinguished achievement in the field of opera and outstanding contributions to the opera world. The prestigious audience at the black-tie dinner counted Joan Taub Ades, Anastasia Angelova, Andrea Anson, Daniel Applebaum, Judith Auchincloss, Susan Baker, Edward Bayliss, Mercedes Bass, Ludmila and J. Truman Bidwell; Susan S. Braddock, Emmanuel Ceysson, Adele Chatfield-Taylor, Eugenia Comini, Alice Coote, Marc Chazaud, Judith-Ann Corrente, Annette de la Renta, Janet Desforges, Gilles DeVoe, Ying Fang, Giovanni Favretti, Edmeé and Nicholas Firth; Carole and John French, III; Francesco Genuardi, Barbara and Robert Glauber, Neal Goren, John Guare, Sterling Morton Hamill, Nancy L. Hayward, Kathleen Kim, Christopher Koelsch, Maya Lahyani, Helen and William Little, Nora London, Stewart Manger, Ellen F. Marcus, Louis Miano, Carol and Richard J. Miller, Jr, Laurent Naouri, Lynn Nesbit, Donald Palumbo, Emily and John Rafferty; Ron Raines, Diana Reid, James D. Rigler, Jennifer Rowley, Mary and Winthrop Rutherfurd; Brenton Ryan, Sana Sabbagh, Bethy Sapery, Rosita Sarnoff, Marc Scorca, Rob Simon, Annaliese Soros, Daisy Soros, Ward Stare, Elizabeth Stribling, Elizabeth Tunick, Kara and Langdon Van Norden, Jr.; Dona D. Vaughn, Baron Lothar von Maltzahn and Baroness Nina von Maltzahn; Alexander Vinogradov, Michael Volle, Kenneth and Susan Wallach, Andrew Martin Weber, Midge Woolsey, Basilia Yao, Christain Zaremba, Maria Zifchak and Ann Ziff among the many notable attendees. Also in attendance were rising stars of the Lindemann Young Artist Development Program including Rihab Chaieb, Hysand Park, Gabriella Reyes de Ramiréz, and Zalman Kelber. 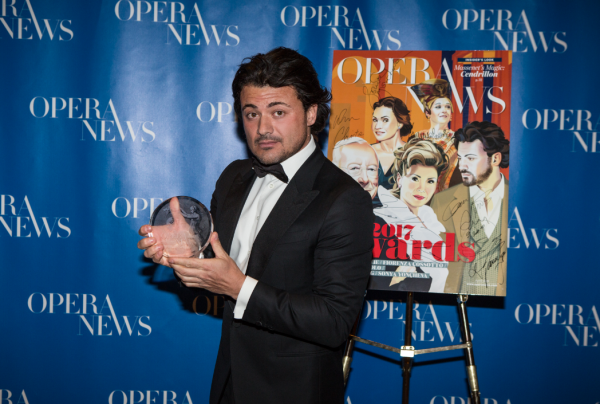 The OPERA NEWS Awards showcased live packages auctioned off by Robbie Gordy, Associate Vice President and Auctioneer at Christie’s New York, which included a private ukulele sing-along concert with Stephanie Blythe; a private brass quintet recital with members of the Metropolitan Opera Orchestra; and an exclusive seven-day retreat at Monteverdi Tuscany. In addition silent one-of-a-kind offerings included an exclusive behind-the-scenes tour of the opera archives at The New York Public Library for the Performing Arts; an afternoon for two with Ailyn Pérez and OPERA NEWS Editor in Chief F. Paul Driscoll at Lincoln Ristorante; golf and lunch for four at the historic members-only Ardsley Country Club; four luxury box seats to the New York Giants at MetLife Stadium; two tickets to MY FAIR LADY at Lincoln Center and dinner at Café Luxembourg; two tickets to the world premiere of Lembit Beecher’s SKY ON SWINGS, and an evening stay at the Bellevue Hotel and premium tickets to CAROUSEL on Broadway with dinner for two at Sardi’s. 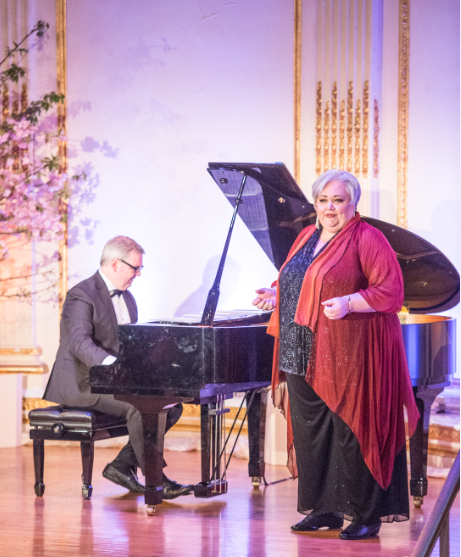 The 13th Annual OPERA NEWS Awards was sponsored by the Lloyd E. Rigler – Lawrence E. Deutsch Foundation.